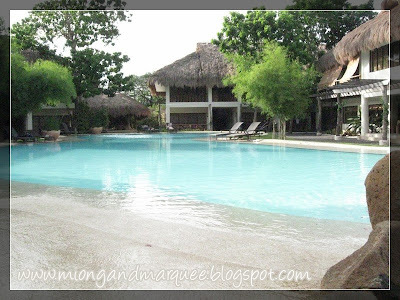 Matudnila.com - A Cebu Events Blog: Maribago Bluewater Beach Resort at its finest! Home Maribago Blue Water Resort Maribago Bluewater Beach Resort at its finest! Maribago Bluewater Beach Resort at its finest! My weekend never been that stimulating! After a half day of work from the office then feels the change of setting from routined workaday from Cebu Business Park to upwind Mactan Island where Maribago Bluwater Beach Resort Rests. Via SM Northwing I meet other members of Cebu Bloggers Society(CBS) where Ruben Licera of Pinoyworld.org and PR of Maribago Bluewater Beach Resort. At exactly 3:00pm on my phone, we jumpstart towards the destination terminus, where She Embraces the Charm Of Island Living: Maribago Bluewater Beach Resort! When we reached the resort, we are then given a necklace of sea shells (which i fell makes us very special) and offered a Vitamin C enriched drink and introduced to a tour guide that showcases us the first class of its kind Amenities of Maribago Bluewater Beach Resort. First drop is the AMUMA SPA that includes Facial, Body Care, Massage Treatments. Plus the AMUMA Signature Packages : Hilot Journey and Malakas at Maganda(Couples). Activities like Strtching, Tai Chi and Arnis are also present. After the tour is the "little chit chat" with the Resorts Big Boss and Managers. Of course with their artistic means of preparing goods to delights their visitors. Everybody in there enjoy it! Guess what next? the Swimming Sessions! We did our wet sessions at the cove and afterwards at the Village Pool I guess that is situated somewhere beside te shark Aquarium. And theirs an assurance that those sharks can't go swimming with us. Kidding! All settled for you at Maribago Bluewater Beach Resort. 158 well Appointed Rooms, Guest Services such as Airline booking & confirmation, Dining in at lest 6 Prime Restaurants, Recreation: water sports, and anything you can thinks of, Entertainment specials such as Barrio Fiesta with Cultural Show, Banquet, Business Function and Party Facilities. Maribago Bluewater Beach Resort managed to put up a man-made Island that situates a Cove formation on the beach side providing a rest for the Seascape and Island charmed. The island's name Alegrado Island stretches the Resort width and caters any event you coud wish for. 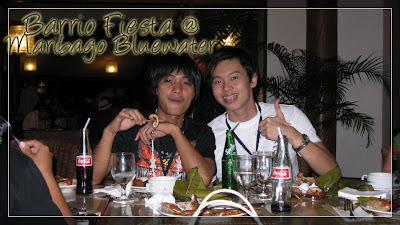 Bloggers weekend at the Maribago Bluewater Beach Resort will never be complete if the infamous Barrio Fiesta is not served. "Immense in the Phillipines Culture! Feasts in Filipino Cuisine anf enjoy the Cultural Dance Extravaganza!" 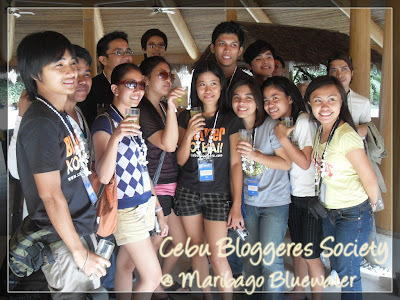 Cebu Bloggers shared some wacky thoughts during the meal. Enticing Indeed! Great food and companion in a great Venue! All of those, stimualtes my needs as human. 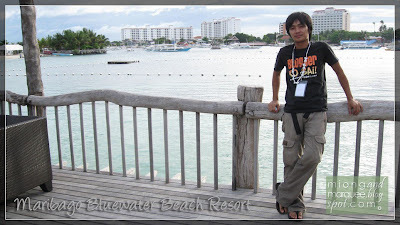 5 comments: on "Maribago Bluewater Beach Resort at its finest!" Thanks, Miong for the post! I think, we'll wait for Maribago to view ur entry. kita nya ta sunod laag. sumilon daw. harhar! Sayang, anyway, Maribago Bluewater has many more treats for us!